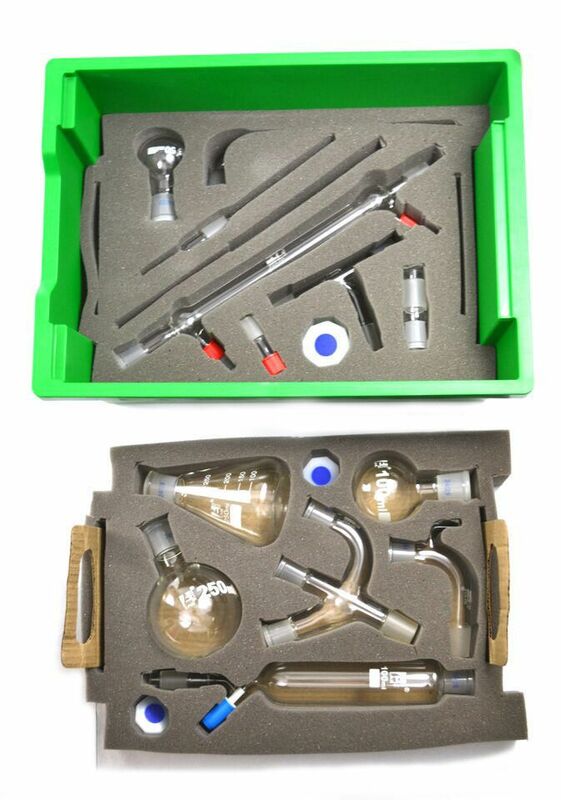 The Sixteen-Piece Organic Chemistry Glassware Set is perfect for organic chemistry labs, enabling applications in distillation, fractional distillation, separation, purification, and synthesis. All pieces are made from high-quality borosilicate glass. The set is supplied with a hard plastic case. Ordering information: This kit includes a Liebig condenser, dropping funnel, reduction adapter, air-leak and steam-inlet adapter, receiving adapter, multiple adapter, 250 mL Erlenmeyer flask, 250 mL round bottom flask, 100 mL round bottom flask, 50 mL round bottom flask, 2 stoppers (19/26), socket cone, stopper (24/29), and thermometer.